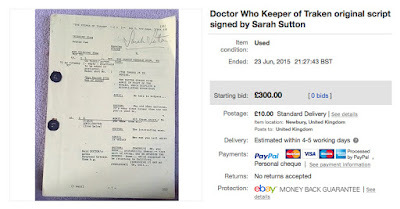 The first item I spotted on eBay this month was original sold at the 1991 Bonhams Doctor Who auction. The tag on the helmet relates to that auction. 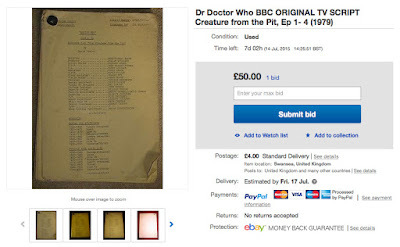 GENUINE ULTRA RARE SCREEN SEEN DR WHO PROP FROM THE HIGHLY SOUGHT AFTER TOM BAKER ERA OF DR WHO. REGARDED BY MANY AS DR WHOS GOLDEN AGE. PROPS FROM THE TOM BAKER PERIOD VERY RARELY SHOW UP. THIS IS A CHLORIAN GUARD MASK FROM THE 1979 ADVENTURE "THE CREATURE FROM THE PIT" IT IS IN EXCELLENT CONDITION WITH NO SCRATCHES OR CHIPS, AND HAS BEEN LOVINGLY STORED IN MY PRIVATE COLLECTION. 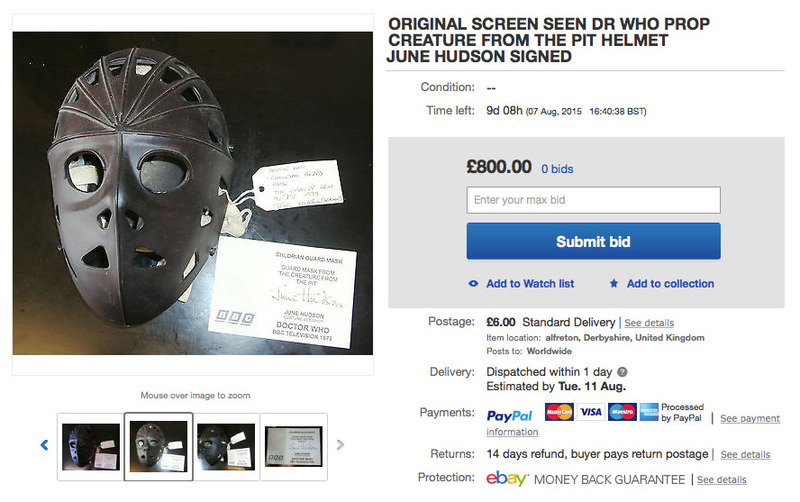 A VERY RARE OPPORTUNITY TO OBTAIN A GENUINE PIECE OF TV HISTORY FROM EVERYONES FAVOURITE SHOW. VERY RELUCTANT SALE FORCED ON ME BY THE CURRENT FINANCIAL CLIMATE. I WILL OFFER THIS FOR SALE ONE TIME ONLY. IF IT DOES NOT SELL, I WILL NOT BE RELISTING. Plus someone is selling of their script collection on eBay this month, and here are the times relating to the Fourth Doctor. 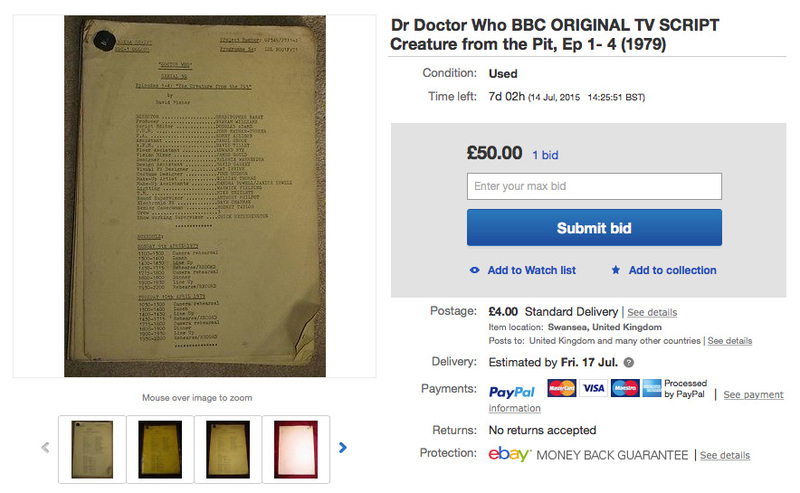 Listed is a original BBC Doctor Who Script. The Camera script is entitled Creature from the Pit, episodes one to four, starring Tom Baker as the 4th Doctor. The item is fragile with pin rust , the back page has become detached but is present, and pages shows wear with some holes here and there. So take this into consideration when bidding. This item was obtained by me from a private collector whose associate worked for the BBC, and came into his possession before mine. 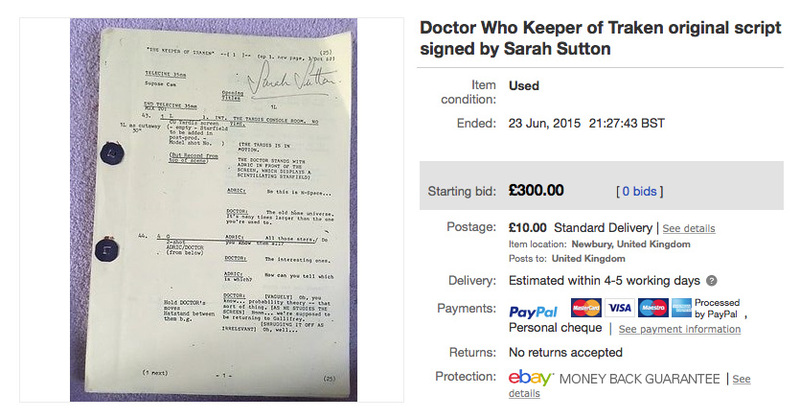 Update 6th July 2015: I've added further pics of the script due to facebook questions from fellow Doctor Who collectors. Just to add to the original description that the script has been located in its original 70s plastic folder (plastic very brittle & fragile) which has flattened out any folds in the script since the first pic was uploaded (see picture). Also to say further which I forgot to mention is that the script is multicoloured being yellow, blue, white. Also, I've added the back page picture to show the detachment and condition alluded to in the listing. Original script - this belonged to Sarah Sutton. I won it at an auction. It is printed on yellow paper, which is rather faded. Please be aware that this paper is 38 years old, and accordingly is fragile. Some of the metal butterfly clips have rusted and stained the paper. I came by it as I was a close personal friend of John Nathan-Turner, who produced Doctor Who in the 1980s. Upon his death (2002), and that of his partner (2007), I was left his extensive Doctor Who collection, which included a number of scripts, including this one. John had them in his private collection due to the fact that the BBC "Classic series" production office closed in 1990, and all of the paperwork and contents of the office were to be destroyed / dumped. John realised their value, and thankfully personally saved them all, and stored them in his home in Brighton. They were untouched in storage until 2007 when I took charge of them. Please be aware that these items are absolutely unique. There may be "other" copies or duplicates of this script around, but this is the "file" copy held in the production office filing cabinets.